The 2018 Contact Centre Summit saw an impressive increase in the diversity and seniority of its audience from 2017. Of more than 250 attendees, 44% were at Director Level or above, and the average budget was almost $9 million. With a greater number of attendees from the Financial Services, Utilities and Healthcare sectors, CCW2018 also cemented itself as a broad cross-industry summit capable of delivering an audience as senior and experienced as the speaker lineup. As the summit evolves to meet these new audience demographics so too will the event’s partners. Now more than ever, partnering with CCW will put you in front of the key decision makers responsible for shaping their organisation’s customer contact. 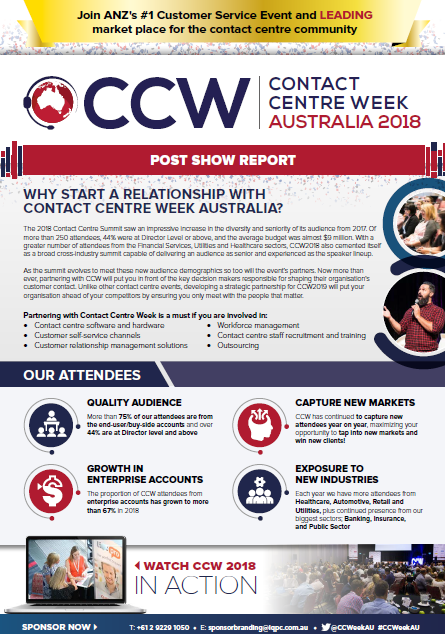 Unlike other contact centre events, developing a strategic partnership for CCW2019 will put your organisation ahead of your competitors by ensuring you only meet with the people that matter.